Since I was 4 years old sport has been my passion. I have competed in a large range of sports, from Gymnastics to MMA. 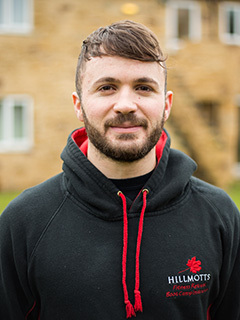 I began to study Sport and Fitness in which I completed the level 3 BTEC sport & fitness and took part in various other sporting activities and seminars. 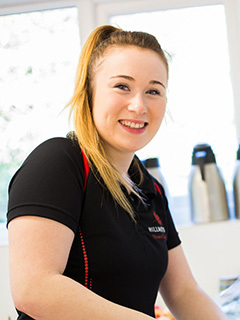 Whilst studying, it was my aim to gain as much experience in the fitness industry as I could because I believe experience and passion are the keys to being a great trainer. So I began running my own fitness sessions outside which were HIIT workouts. I also worked in a gym, instructing a variety of indoor and outdoor classes including a battle ropes class, HIIT, circuit classes, military boot camp style training, and kettle bell training. In my opinion Functional movements are the best and safest way to exercise and I always try to incorporate this method into my training sessions whichever style of fitness I am training. There is nothing better than helping a person realise and reach their full potential, pushing your body to the limit to reach your goal reveals fantastic results. As training dirty and eating clean are absolute necessities. Chris qualified as an exercise professional eight years ago through Premier International and the International Sports Science Academy. 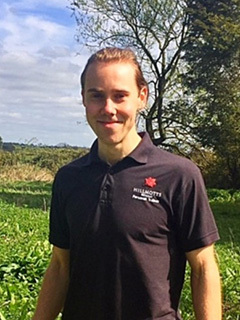 Having previously worked as a Personal Trainer from gyms in Manchester and London, he now lives in Brighton running his own outdoor and home training service. For 4 years Chris has been with Hillmotts and in that time has had a huge influence on our guests. His warm and academic approach leaves people leaving camp with the clarity and confidence needed to succeed further. His infectious passion for fitness along with his ability to translate information effectively makes him a valued team member. 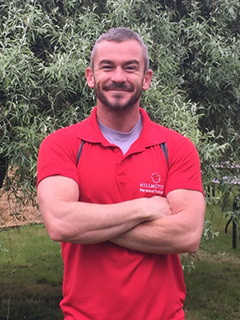 I started my career 5 years ago as a massage therapist, which led me to work in a premier gym in London. This is where I found my love for health and fitness, and decided to study as a personal trainer. Summer 2016 I was lucky enough to get a job at Hillmotts. I love teaching all the classes we offer from kettle bells, circuits, HIIT, Boxerciser and more! Every class is different and we make exercise as fun as possible. Nutrition is a huge passion of mine. I’m always looking and trying out new recipes, to share with the team and guests. My aim is motivate guests to achieve the most they can during their stay at Hillmotts, and educate them on how to live a healthy balanced lifestyle after their time at Hillmotts. Hi I’m Damian. I spent 7 years in the Prison service starting my time as a Prison Officer and at the end of my career a Physical Education Officer. Through my love of fitness I qualified as a Personal Trainer during this time. After working with private clients and furthering my knowledge and skills, I taught a Level 2 Gym Instructor course in the Prison Gym, which was rewarding to apply the knowledge I had learnt and to help teach others. As a trainer I like to focus on health and lifestyle as I believe if there is a good balance in these then a great physique will follow. My training principles are based around short intense sessions of Strength, HIIT and Endurance to improve fitness as well as body composition. The same goes for nutrition principles, focusing on health and what the body really needs. 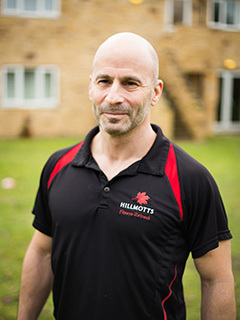 I came to Hillmotts in October 2016 wanting to teach and motivate guests and love how we all as trainers teach a change in lifestyle, as opposed to diet and exercise.